I didn’t expect growing vegetables to necessarily be easy here in central Texas. And it isn’t. Neither the peas nor beans seem to be thriving; in fact, the peas look like they’re burning up. At the same time, I’m not sure what’s wrong with the beans. 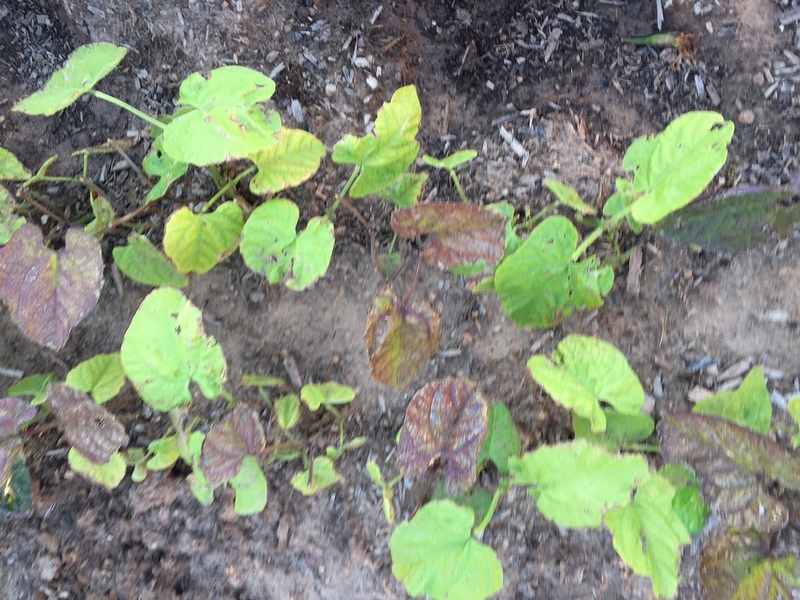 The bean packet I bought was a mixture of green and purple beans, and the leaves on the purple beans seem to be shriveling. In addition, I think something’s been nibbling on them, chewing off new growth and possible blossoms. I’ve tried the natural concoction of oil, dish detergent, milk, raw egg and water. While it seemed to work in Wisconsin, I’m not so sure it’s doing anything here. And, while not widespread, a few of the fruits on the tomato plants have holes/brown spots. I think a fruitworm has been the nibbling on them. Hard to catch them in the act though, when I’m gone during the day. Just have to keep trying though. I really have my mind set on fresh BLTs this summer! Hm…I’ve never grown beans. As for peas thinning mine to 8-10 inches in between healthy plants has been successful, and I always planted them in the winter for spring harvest. Could just be too hot for them now. 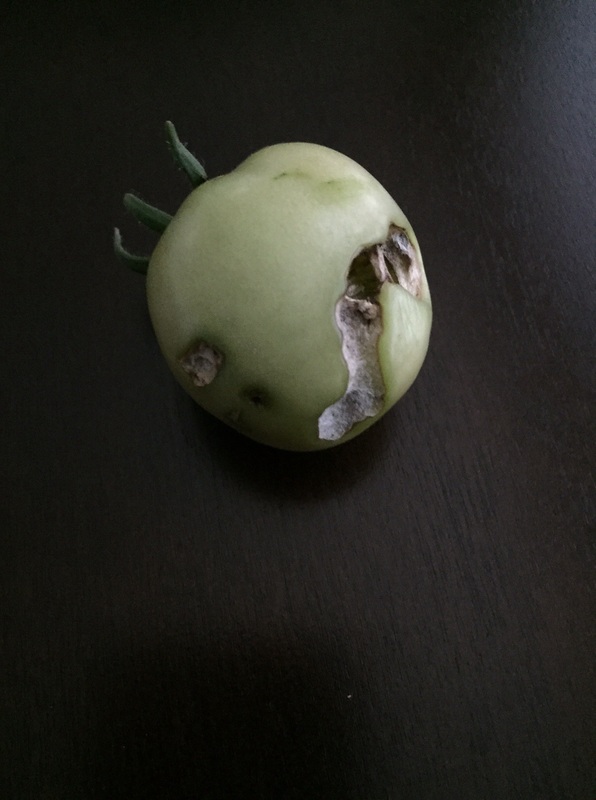 As for the hole in your tomato, it could be earwigs or some caterpillar (tomato fruitworm comes to mind). Either can be managed by ‘predators’ in the garden like the green anole, birds, or wasps. Don’t fret! 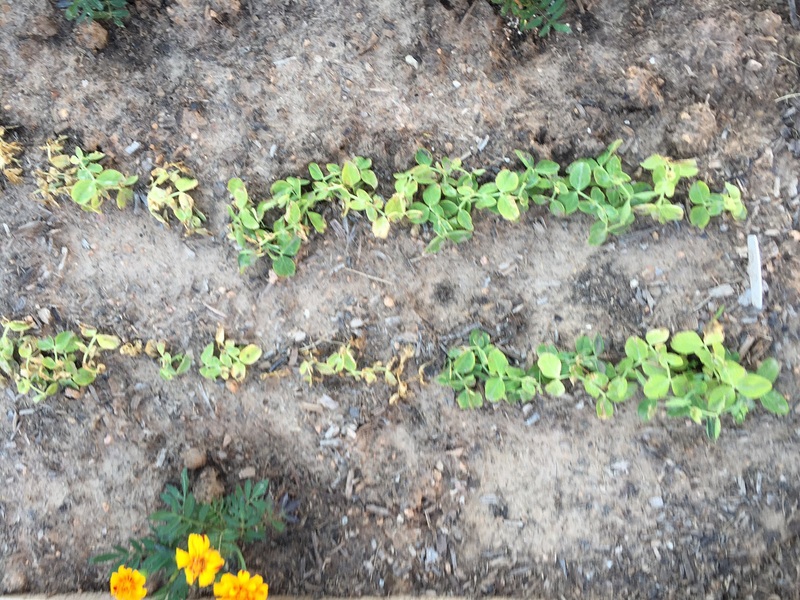 Remember the combined failures (a/k/a/ plant death) are an integral part to gardening success. I don’t think you can have one without the other, and you are literally starting over coming to Texas! I think it’s fruitworm(s) in tomatoes – saw something and Googled it, and that’s what it looked like. The part of Wisconsin I came from had just started seeing earwigs the last 3-5 years. I ABSOLUTELY HATE them. They are so gross. They loved the wetness of the dishwasher, and it was just, well, gross to see them there!